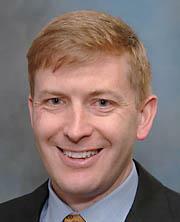 Dr. Nelson is an Associate Professor in the Department of Orthopaedic Surgery. His clinical interests include sports medicine, specializing in ACL injuries and reconstructions, revision ACL reconstructions, articular cartilage injuries, meniscal injuries and transplants, shoulder instabilities, arthroscopic shoulder surgery, and arthroscopic rotator cuff repairs. He is a member of the Department of Orthopaedic Surgery and the TRIA Orthopaedic Center.